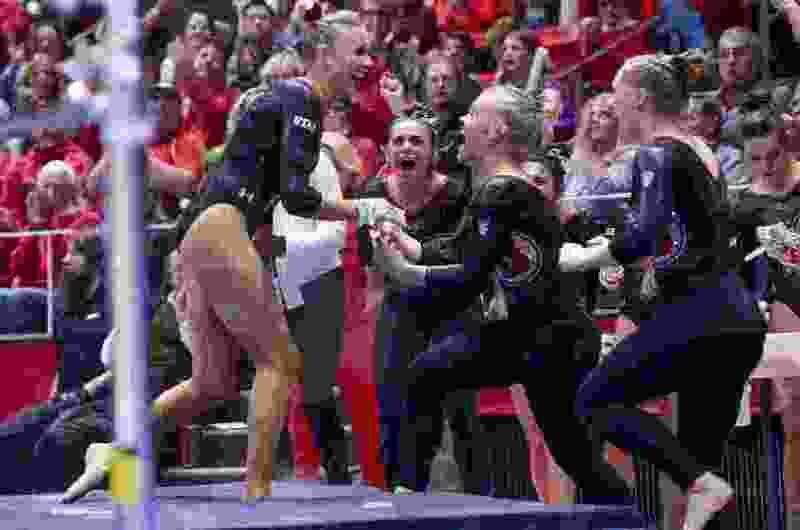 (Leah Hogsten | The Salt Lake Tribune) The Red Rocks celebrate MaKenna Merrell-Giles' bars routine as the No. 4 Utah gymnasts host No. 20 Georgia in the final regular season meet at Jon M Huntsman Center in Salt Lake City Friday, March 16, 2018. The best gymnastics conference in the country will be having it out for the Pac-12 crown in Utah. On Wednesday, the Pac-12 Conference and the Maverik Center announced a multi-year deal that will feature the conference’s women’s gymnastics championships in West Valley City for the next three years, starting in March 2019. This partnership will feature the first-ever neutral-site host for the Pac-12’s conference title. The Maverik Center, home to the Utah Grizzlies of the ECHL, will be able to seat 9,000 spectators for women’s gymnastics the next three seasons. It hosted Olympic hockey at the 2002 Olympic Winter Games in Salt Lake City and held a post-Olympics gymnastics tour in 2012. The Maverik Center appealed to the Pac-12’s elite by featuring a podium equipment set up, similar to what the annual NCAA Championships are conducted on every year. It was a unanimous decision from all Pac-12 coaches that the conference’s annual championship meet needed to be on a podium, like nationals each year and the Olympics every four-year cycle. With both the Big 10 and SEC having adopted a podium-style championships, the Pac-12 felt it was time to follow suit. While the conference office made the decision to pick West Valley City as its first neutral site, it certainly didn’t hurt that Utah’s reputation in the sport is among the country’s elite. Having a raucous devoted fan base helps, too. “That decision was in their hands, but I can’t help but think the way the state of Utah has embraced gymnastics and the way the city of Salt Lake has embraced the Red Rocks program, I can’t help but think that was a feather in the cap of our program,” Farden said. The Red Rocks are among the top programs in the country, sporting three Pac-12 titles and three runner-up finishes in their seven seasons since joining the Pac-12. The Huntsman Center has twice hosted the Pac-12 Championships, in 2012 and 2014. Utah is coming off a fifth-place finish nationally in 2018 as conference rival UCLA took home the national title. The 2019 Pac-12 championships will be held Saturday, March 23, 2019. That’s the same day as second-round matchups of the 2019 NCAA men’s basketball tournament is scheduled to be played in Salt Lake City at the Vivint Smart Home Arena. First-round games are scheduled to start Thursday, March 21, and continue two days later on March 23, guaranteed to make that weekend a college sports spectacle. Pac-12 gymnastics powers-that-be vetted other potential venues and candidate cities for the first three years of this endeavor, but they chose the Salt Lake Valley first. After this, the hope is that the neutral site is a hit and some other venue in another Pac-12 city is ready to be the next to pick up the torch.